Day 01 :Casablanca / Rabat / Meknes/fes. 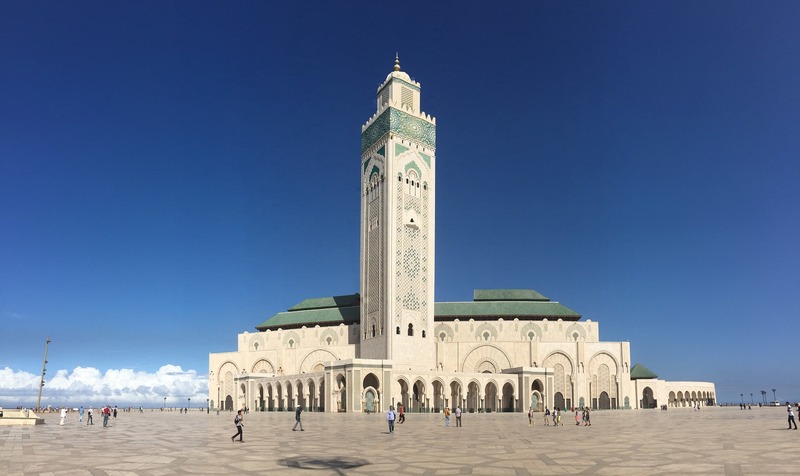 Upon your arrival at the Mohamed V Airport in Casablanca, Mohammed V International airport, While in Casablanca, you will visit the Hassan II Mosque in Casablanca, the third largest mosque in the world . 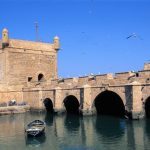 After you will Drive to Rabat where you will visit the best sites of this city such as the Hassan Tower , Mohammed V Mausoleum, and the Oudayas Kasbah overlooking the Atlantic . Then travel to Meknes , one of Morocco’s ancient imperial cities, you will continue to Fes and ending your day with dinner at your Riad in Fes. The whole day is devoted to tour this UNESCO World Heritage City.Sightseeing of Fes includes the medieval medina with its Attarine and Bou Anania Medersas,the Nejjarine fountain, the Moulay Idriss mausoleum,and the Karaouine mosque.Afternoon visit of Fez al Jdid – new Fes.In the evening check into your riad. Departure from Fes at 8 o’clock, travelling via Azrou, where you can see Barbary apes in the forest of the Middle Atlas. Lunch is in Midelt, the apple capital, at the foot of the Ayachi Mountain. We continue over the Tizi-n-Talremt pass and through the Ziz Valley, which is particularly well-known for its palm trees and the length of the oasis. All along the road there are innumerable ksars, small villages of individual houses. 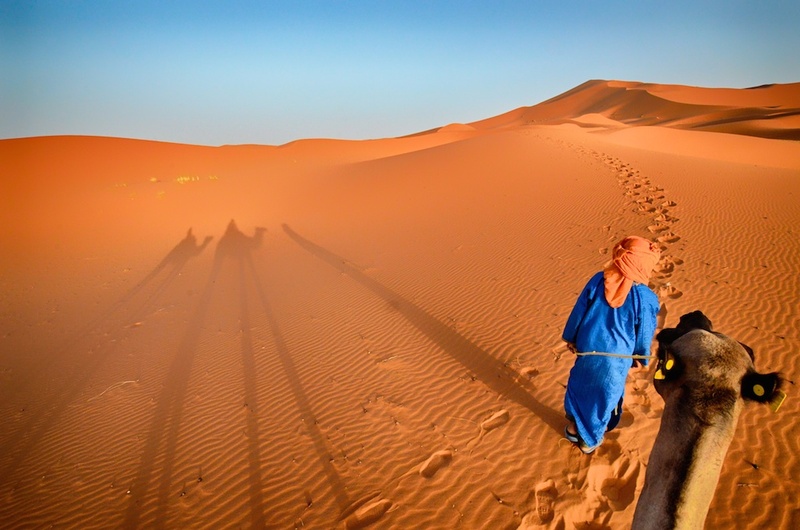 From here we reach Er Rachidia and then Erfoud, famous for its date festival and fossils.Then continue to Merzouga ,where you will meet your camel guide to ride into the dunes to the bivouac(camp).Dinner and overnight will be under the nomad tent. The trek will start right into the desert for 1:30min, We will spend the night in an equipped camp in the middle of the Sahara,this is a great opportunity to take lovely pictures of the sunset and sunrise, when you arrive at the camp you walk to the high dunes to see the sunset ,It will be a magical night when the sky is clear of cover and stars sparkle and shine with intensity.There will be a wonderful dinner around a campfire,you will spend the night in nomad tents. In the morning you will ride the camels backing to Merzouga , you’ll have the breakfest and shower in Our hotel in Merzouga, you’ll leave for Rissani there you can visit the souk (the biggest Market in area)then continue to Tinghir, and Todra gorges , the highest, narrowest gorges in Morocco. After lunch in the heart of the gorge we will drive through the Dades Valley, where you’ll see the majestic sand castles and the amazing rock formations known as “monkey toes”. Overnight accommodation will be in a fancy hotel overlooking the Dades valley. 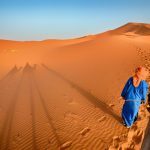 After breakfast, departure to Ouarzazate passing through the Dades Valley, the line of kasbahs that give this extremely popular route its nickname as valley of a thousand kasbahs. Just before the town of Skoura, visit Kalaa Mgouna, the rose city, where you can purchase local rosewater.We will continue to Ouarzazate. “the Hollywood of Africa”. 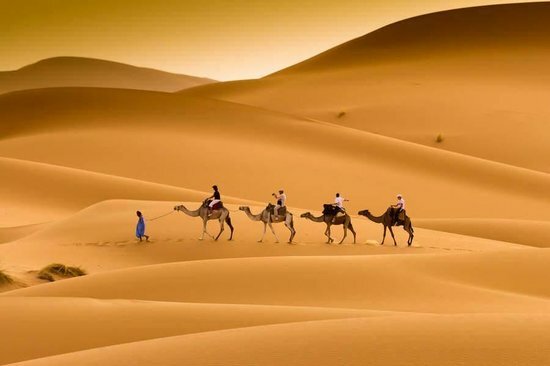 On, through the “Road of the thousand Kasbahs”- the fascinating “sand castles”. 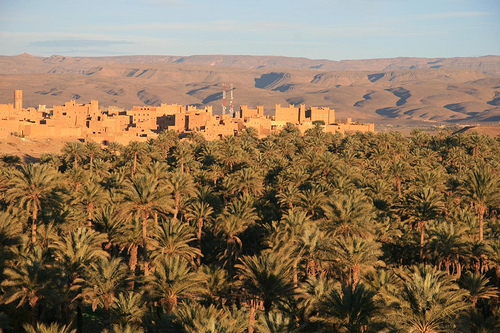 After 30 kilometers from Ouarzazate We will stop at the famous Kasbah Ait Benhaddou . The kasbah is one of the most intriguing red earth castles lining the ancient road of the Kasbahs, and is a UNESCO world heritage site. Lunch by the Kasbah and continue on our way to Marrakesh through the famous Tizi -in-Tichka pass over the High Atlas Mountains. The range has snow on its peaks most of the year. Appreciate the beauty of the timeless landscapes on the twisted roads through Berber villages. Arriving Marrakesh overnight accomodation in Riad. After breakfast, we will start exploring Marrakesh, [ the red city of Morocco], also known as the pearl of the south. 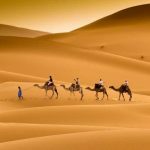 Our guide/ driver will ensure that we see the most important places of historical and cultural interest: the Saadien tombs, the palaces of El Bahia and El Badi, and the Ben Youssef Coranique school. in the afternoon visit the gardens at Majorelle, the Menara and the Koutoubia tower. Overnight, stay at the riad in Marrakesh. 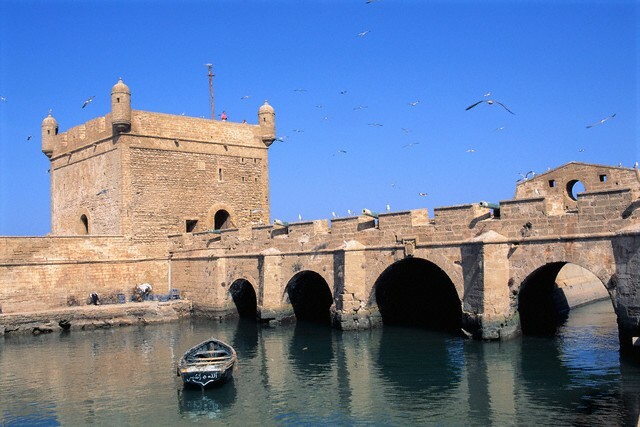 we will depart for the Romantic seaside town of Essaouira ,a charming, centuries–oldporttown on the Alantic coast known for beaches, modern art, traditional crafts ans a unique blend of architectural styles. Essaouira is a typical Portuguese harbor portraying influences of both Moorish and Portuguese design.overnight accomdation in Riad. After breakfast , transfer to Casablanca Mohammed V International airport for your return flight. End of our services.